The Senate Health, Education, Labor & Pensions (HELP) Committee unanimously approved The Opioid Crisis Response Act of 2018 Act on April 24. The approval was a major step forward in addressing the current epidemic as a public health crisis that requires collaboration among people, communities, families, states, and the federal government. With bipartisan support, significant provisions taken from or aligned with the goals of the Heitkamp-Durbin Trauma-Informed Care for Children and Families Act (S. 774) were incorporated into the opioid legislation, including creation of a task force on trauma, and grants for trauma-informed schools. Sec 514 – Authorizing grants that link educational agencies with mental health systems to increase student access to evidence-based trauma support services to help prevent and mitigate trauma that children and youth experience. In his opening marks, Committee Chairman Lamar Alexander (R-TN) said the crisis requires the energy of a moonshot, but can’t be solved in Washington, DC. “What the federal government can do is create an environment so that everyone – judges, mayors, counselors, police officers, Drug Enforcement Administration agents, doctors, nurses, parents, pharmacists, and hospitals – can succeed in fighting the crisis,” said Alexander. 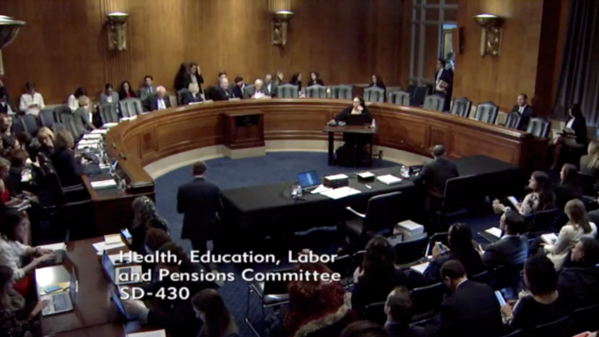 In her opening statement, Sen. Patty Murray (D-WA), ranking member of the committee, described trauma-informed care provisions in the bill as “near and dear to my heart” — referring to language to create a trauma-informed task force and grants for schools. She said she had heard from an elementary school principal who described how children were having trouble in class because of the trauma of a family member’s addiction, and how teachers were having difficulty understanding how best to help those students respond to their trauma productively. Murray also looked ahead to the committee’s agenda next month when there will be a markup of a bill to address maternal mortality, an increasing problem especially for women of color. The bill is the Heitkamp-Capito Maternal Health Accountability Act (S. 1112). Sen. Maggie Hassan (D-NH) told the story about a nine-year old girl who followed her to her car as she left a meeting in New Hampshire. The girl explained to Hassan how her cousin’s death affected her because her aunt (her cousin’s mother) and her mother were so sad. Hassan said she looks ahead to a time when nine-year-olds don’t have to experience this kind of tragedy. Sen. Tammy Baldwin (D-WI) noted the importance of providing flexibility in targeted state grants to address substances other than opioids. She cited the huge problem in Wisconsin with methamphetamines. At an April 11 hearing on the bill, Sen. Lisa Murkowski (R-AK) lamented the impact of alcohol on communities in Alaska. Alexander said he expects final action on the bill in the Senate this summer after other committees such as Judiciary and Finance, which have jurisdiction over aspects of the crisis, have completed their work. A video of the April 24th HELP Committee markup is available on the committee website. Click here for the text of the legislation and here for a detailed summary. A section-by-section of the bill is attached.